Taking photos is one of the most effective forms of memory keeping. These days more than ever with the improved technology of smart phones and other electronic devices, most of us are taking more and more photos on the go, which may have in turn meant our photos are more disorganised than ever. 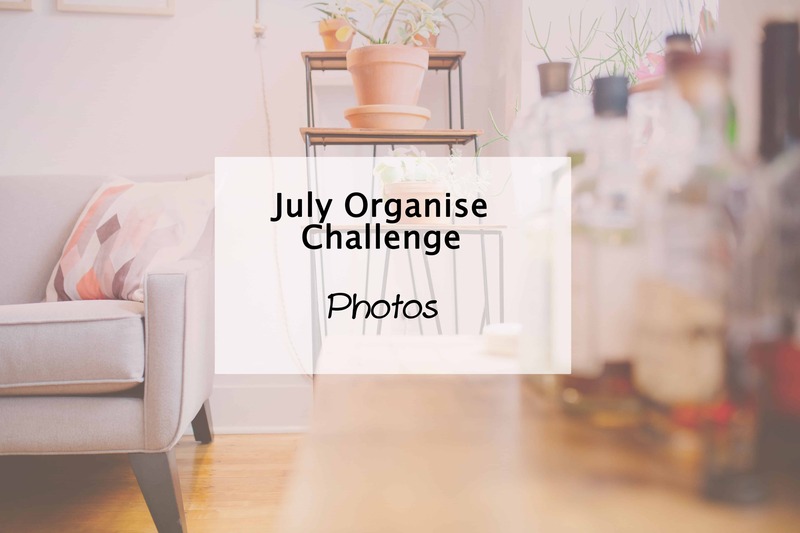 This week our Simplify My Life task is how to organise photos. There are many options to organise photos. Different systems and methods suit different people, so it helps to consider some alternatives until you find a method that works for you. You will also need different methods for digital photos compared to printed photos. However before we can organise photos, there are a few steps to make your process easier. This means uploading all your digital photos from each different media onto your computer or hard drive (memory cards, phone media, tablets and other photo taking devices). Same goes for your printed photos – put them all in one place, rather than having them scattered around the house in different drawers or boxes. Digital photography tends to come with a lot of extra snapping. Instead of making each frame count like traditional film, we just keep clicking away, in search of the perfect shot. If you are anything like me, you generally get a couple images of the same moment, with very little difference. This may take a while if you take a lot of photos, but consider going through and deleting duplicates, and anything that doesn’t meet the cut. If you would never print it or if it was a photo taken in error, there is no real need to hold on to it. Go through and delete the images that don’t meet your approval. Tip: If you aren’t comfortable with deleting the duds, put them in a separate folder so you can retrieve them later if the need arises. With your printed photos, you can do similar. If you have over exposed images, or anything taken in error or that does not actually have a relevant subject featured, consider throwing them out. Less photos are easier to organise. Now you want to get organised. There are plenty of programs available that can take a lot of the effort out of this job, such as the Photoshop Elements software or iPhoto on Mac. There are plenty of other software options, each with similar functions. Many allow you to tag photos, add them to different categories, events or albums to allow you to find what you want easily. Some photo software has technology to identify who appears in the photos to allow you to organise them by person. This is great when you need to search for a particular photo down the track. Alternatively you may wish to organise photos with tags for places, names, etc, or simply organise them by date. If you would rather not invest in a computer software to organise your digital photographs, you can also make great use of folders on your computer. As a Microsoft PC user from way back, I find it easy to organise photos simply using a folder system on my computer. Photos saved in year folders, with sub folders for each month. When searching for a particular photo or when doing my project life layouts, I use the folder sorting option to sort by date and this allows me to view photos in the order they were taken. Nothing fancy but it does the job and I always know where to find my photos. Windows also gives options to tag and add categories and ratings to your photographs anyway, just like an add on program, but minus the price tag. How many times have you heard someone you know lost their treasured photographs due to a computer crashing or a phone being lost? Too many, and yet have you backed up your photos lately? If the answer is no, time to mend your ways quick smart! There are a few options for this. Again, each with pros and cons. I like to do a bit of a combination so I have the extra security that my photos are safe. External hard drive – cheap and require little tech knowledge, but they can fail too. CD – can require a lot of time and storage and also the risk of CDs failing over time. Cloud – this is the safest option, having your photos saved on an online cloud storage system so that you can access them from anywhere and if your computer or devices fail, your photos are still safe on the cloud. Most have a free limited amount of space, but cost for larger space. A good investment to keep photos safe though. Auto Back Up – A cloud system that will back up selected folders and files automatically without you needing to do it. Great if you aren’t so good at remembering to do so yourself. Unless you are using an auto option, you may want to add photo back up to your yearly schedule or your home maintenance planner, to help you stay on top of it and remember to back up regularly. This can be far more challenging than organising digital photos. No dates mean you can’t exactly be chronological a lot of the time and many of us have photos dating back possibly beyond our own generation of family history. For your photos not in albums, consider sorting them into a box or photo filing system that allow you to divide into the categories that suit you, such as family, places, or events. You can add labels to help keep them organised for future reference. Make sure the storage systems and albums you use are archival safe. This means they will preserve your photos without damaging them over time. A lot of old photo albums were not archival safe so you may need to move them to a new, safer option to avoid your photos fading over time. Head on over to the Simplify My Life challenge page to find all the past tasks to declutter, organise and simplify your life and home. How do you organise photos? Share your tips in the comments. I’ve just gone through our digital photos. My goodness, you collect a huge amount of photos when you’re on social media! I’m now trying to cull as I download them. We actually don’t print any photos. I prefer digital albums! I’m lucky to have a husband that is an IT architect so everything on our computers and phones back up automatically onto the server we have in our house, as soon as we walk in the door. I have no idea how it works. Thank goodness for your hubby 🙂 And yes, I would actually hate to know how many photos I have taken in my life. Especially considering so many don’t make the cut and get deleted straight away these days too. Scary thought! oh, i’ve been needing to do this forEVER. it just might be on my bucket list for life 🙂 Although I did just get the shutter fly app and it automatically saves your photos. Then if you do want to print them, they are right there. So, I guess that’s something. 🙂 Thanks for all the tips! That app sounds pretty cool. A great solution for keeping phone pics backed up and organised. I hear they make pretty amazing photo books too.